Try this powerful food that has been described by the United Nations World Food Conference as the “best food for the future” . Store below 25C in a dry place away from direct sunlight. Certified Organically Grown under USDA National Organic Program(NOP), Naturland (an IFOAM Accredited Association) and Halal certifications, the entire production facility that produces Mountain Organic SPIRULINA is certified HACCP, ISO 22000 and GMP (Good Manufacturing Practice). 100% pure plant fertilizer is used in the Mountain OrganicSpirulina growing ponds to produce a naturally fresh and clean Spirulina that tastes good. 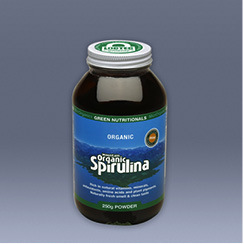 Mountain Organic Spirulina contains NO dairy, NO gluten, NO animal products, NO chemicals, NO pollutants, NO Genetically Modidified Organisms and is suitable for vegetarians and vegans. Mountain Organic Spirulina is packaged with the unique LOCTEC™ Nutrient Protection Technology that combines 100% recyclable amber glass bottles and metal caps to provide the best nutrient protection from oxidationand light damage.